If you’re trying to find an electric scooter for adults in 2019 then you’ve come to the right place. In this article, I will go through everything you could possibly want or need to know prior to purchasing one of these modern electric personal transportation vehicles. With over 5 years of experience with PEV’s(Personal Electric Vehicles), I know I have the knowledge to help guide you into making the right electric scooter purchase. A trend that has been rapidly increasing since it was first introduced by Razor back in 2003, the use of electric scooters as a means of transportation. Even though their first models were purely aimed at kids as ride-on toys, today’s models have much more to offer. Perhaps you’ve already familiarized yourself with this easy, cheap, and eco-friendly way of commuting to work, school or wherever you’re going. Riding one isn’t just for environmentally conscious people, even though that is a great side effect. The main reason to why we tend to use electric scooters over a more traditional type of transportation is due to the fact that it’s cheaper to maintain, easier to use, and in many cities faster than a clumsy old car. Electric scooters are very easy to operate and I have yet to see anyone needing more than just a few minutes to get the hang of how they work. Zig-zag your way through the traffic without having to worry about traffic jams. There are endless types of scooter models and they can easily accommodate anyone from the age of 2 up to 100. Of course, you have to pick your scooter accordingly. So, whether you’re a toddler, a kid, a teenager, an adult, or even suffer from a disability. There is a scooter waiting for you to ride it. We just gotta know which ones to look at, and that’s where I come into the picture. So, without further ado, let us jump straight to the head-to-head comparison before we dwell deeper into the detailed reviews. Which of these fantastic scooters should you pick then? How far you need to go. How fast you need to get there. And if you prefer a seated or standing position, or why not both. You should also consider looking at their weight capacity. If you aim to buy an electric scooter for your kids then you can pretty much skip the weight limitations, but as an adult, the electric scooters weight capacity is of importance. Glion Dolly Review – The perfect commute electric scooter? Haven’t decided on which electric scooter might align with your needs just yet? Here is a complete list of reviews on consumer favorites that I have had the opportunity to take for a spin throughout the years. I will share my experience, prior consumers feedback, and all you need to know about each model. ■Double Disk brakes ■Usb mobile phone charging function ,IP65 waterproof. ■Brake light ■Anti the warning ■Max Load Weight:250kg/550lbs. The Speedway Mini4 boasts a 500W hub motor mounted in the rear wheel. It is equipped with an 8” front pneumatic tire and a solid rubber rear tire. Even though the solid rubber tire tends to be a bit bumpier the Mini4 Pro has both a front and rear shock that is really good at reducing these bumps. It can reach top speeds of up to 28 mph and it delivers a good 40 miles range per charge. If you buy the rapid charger you can get it fully charged within 3 hours. That’s about 2 hours less charging time than the Xiaomi m365 with a standard charger. It is one of the most powerful scooters on the market within its size and weight. In comparison to the Qiewa Qmini which is a similar model, it might not have the same top speed nor comfort but on the other hand, it only weighs 36 lbs and that is 12 lbs less than the Qmini. It is equipped with two ground-level mounted headlights, brake light, folding mechanism, add-on seat, and a good backlit display that lets you see real-time data and adjust between different speed modes. If you want something lightweight while still maintaining a high power and distance per charge to tackle any hill or longer distances. The Speedway Mini4 is the right model for you. We got some serious performance out of it during our test with a rider of 170 lbs. The Xiaomi m365 has become one of the most popular scooters around. This scooter is at the moment of writing very hard to get your hands on, and have been so since its launch. But now more than ever after all the electric scooter rental companies have started using them. Companies like Bird, Uber, and Lyft wouldn’t invest millions into something if they didn’t know these scooters would get the job done. The scooter delivers a superior ride compared to others within this price range. Better distance, more comfort and my favorite folding system. When you fold it down the handle latches on to the rear splash guard and it’s really stable while carrying it. It provides a good 15.5 mph and you can get a maximum distance of 18.6 miles on a single charge. It recharges fast and weighs in just under 27 lbs. I think it’s a comfortable and very affordable pick for those who don’t need to go any further than 12 miles on a single charge. You can read more about how it did in our test here. Another high performing electric scooter suitable for teens and adults. It has similar specifics to the Q1 from Qiewa. However, their motor isn’t as powerful. The Speedway IV delivers a good 35 mph top speed which should be enough for most users needs. It can take you up to 60 miles on a single charge and delivers a comfortable bump-free ride. It boasts a 600W hub motor with 10” pneumatic tires provide good grip on both wet and dry surfaces, they also make riding on bad roads viable. It can also handle most of your electric scooter needs unless you’re looking for a lightweight more portable unit. One of the most powerful scooters available that will surely make you look forward to making that errand or commuting to work every morning. It has a high price tag but with quality and performance in mind this scooter will set you up for the foreseeable future. The Qiewa Q1 provides you with a superior scooter experience. It’s able to solve almost all riders problems when it comes to time management and distance. With its 35 mph top speed you can be assured to get there on time. For the long commuters, it provides a breathtaking 60 miles per charge which is about 4-6 times the amount of a standard unit. It’s a heavy duty electric scooter that can take a rider of up to 250 lbs wherever they might want to go whilst still being somewhat compact thanks to its folding system. Fully folded it fits perfectly in most car trunks and with a total unit weight of 55 lbs, it’s pretty light in comparison to what you get. A super comfortable scooter with two independent suspension systems, one in the front and another one in the rear. If you want it to be even comfier there is an add-on seat that can be purchased as an extra. If you want to know exactly how well the Q1 performs in real life, read our review. If you are looking for an adult electric scooter or just a good option for the daily commute, the Glion Dolly is your best choice. It is a great option for that last stop solution, like going those last few miles from the bus stop to the office. The dolly function lets you pull it like a suitcase and it is self-standing, therefore taking it on public transportation or into the store is simple after it has been folded together nice and tight. For those of you who need to go further, any distance under 12 miles should be doable without having to stop for a recharge in-between. It utilizes a fast battery recharging system so that when you finally need to stop for a recharge it will only take you about 3.5 hours for it to reach its full capacity again. This means that you can easily tuck it under your workbench and recharge it at work before you have to head back home. The scooter is durable and made out of high-quality material and you should have no problem using it for 3-5 years before having to consider a new battery with its 1000+ recharge cycles. 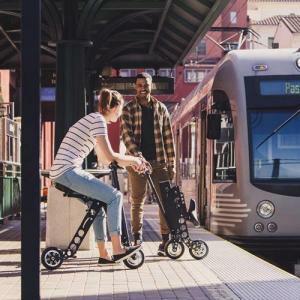 Just like the M365 it is a great lightweight foldable scooter that can easily join you on your public transportation commute. A really good all-around electric scooter that will definitely fit most commuters needs. If you need to go further check out one of the higher performing scooters at the top of our list, they might be heavier but they outperform the lightweight models tenfold when it comes to comfort and performance. The Razor E300 is a great entry-level electric scooter for teens with a top speed of 15 mph and a battery that will give them around 40 minutes of plain fun. Easy plug-and-play function and from a brand well-known for its safety standards. It can handle some heavy rain without being damaged or starting to malfunction. It has been heavily tested by plenty of people before us and it is among the most popular choices to get around campus. The Razor E300 is suitable for children up to 8 years or up to a maximum of 220 pounds. A good, sturdy option for your teenage girl or boy as it comes in many various color combinations. It is available in two different models, the E300S which has a detachable seat and the E300 model that is delivered without one. This American quality model from URB-E is available in two options, Black Label and the PRO GT. Produced in the US it comes with a higher price tag, something it makes up for in features and extreme quality. The aircraft grade aluminum and carbon-built frame with patented design makes it lightweight and easy to transport. The folding mechanism is simple but innovative making the folding/unfolding process as simple as it gets. The comfort is outstanding with a well-padded seat featuring built-in shock absorbers giving you a smooth ride. The comfort is outstanding with a well-padded seat featuring built-in shock absorbers I promise you the ride will be smooth even on harsh terrain. It’s so smooth I even drove it straight out of the curb. A great investment for those looking for a means of alternative transport to get to work or just head to the city. You can take it with you on buses and trains with ease and it fits perfectly in the trunk of your car. If you have mobility issues but don’t feel the need to go all in mobility scooter this is a great alternative. You can read more about the difference between the URB-E Black label and the PRO GT here. Another great and very popular model from Razor over the years has been the E90. The old E90 is now upgraded to the Power Core E90 that is equipped with a new type of motor. A built-in high torque hub motor which gives the scooter a lower weight and increased battery life. This is an amped up standard electric scooter that is aimed to please those around 6-13 years with a moderate 10 mph speed. It has a safety feature called kick-to-start which means that you have to kick it up to 1-3 mph in order to get the scooters push button throttle to work. This totally eliminates the problem of unintentional takeoffs. They have equipped it with good sized wheels but unfortunately, they are still made out of solid rubber which makes it a bit bumpy to ride on. While the standard E90 runs for about 40 minutes, the power core delivers up to 80 minutes of riding fun to your young ones, depending on their weight, terrain, and slopes of course. A good beginner scooter for the youngsters with all safety precautions you might want in place as a parent. My kids are age 4 and 6 they love it. But we are both a bit disappointed they haven’t switched over to lithium-ion batteries for the faster recharges yet. 12-hours of charging for a kids toy. Do they have kids of their own? One full 8-hour charge provides 40 minutes of riding fun! Suggested for riders 3 and up, maximum weight of 50 lbs. Razor pocket mod is a small European Vespa looking scooter that is built for those with a maximum weight of 170 lbs. It has a good speed of 15 mph and is powered by a lead acid battery giving it a distance of approximately 10 miles/40 minutes per charge depending on load. Vintage-inspired design available in a bunch of different colors has made this electric scooter a real hit among young girls who are looking for something that is comfortable and stylish. Vintage-inspired design available in a bunch of different colors has made this electric scooter a real hit among young girls who are looking for something that is comfortable and stylish. The 12” pneumatic tires and rear suspension system makes it handle bumps and various terrain very well and they even added a secret storage underneath the padded seat for stashing small necessities. We would highly recommend it to kids aged 7 and up due to its speed and size. The top pick among toddlers would be the Pulse Performance. Which has a very good price point considering they’ll grow out of it pretty fast. Safe Start from Pulse performance is a highly appreciated scooter among both the toddlers and their parents. Acceleration and deceleration are both smooth and the scooter is slow enough so for parents stop worrying about hasty accidental takeoffs or hard breaks throwing them off balance. Knowing toddlers has yet to develop full-body control at this age it is equipped with two front wheels and one back wheel to provide maximum stability and great maneuverability for easy steering. It has a 50 lbs weight limit and we recommend it for kids up to a maximum of 4 years. After that, they’ll be bored just by the sight of it and you should consider one of the options above. With the Super Turbo 1000W from Supercycles & scooters, you get a really fast electric scooter that posses great performance on various terrain and a top speed of 26-30 mph depending on your weight. It has a button that lets you switch between two different modes economy and turbo which basically translates into getting you further or getting there faster. It comes equipped with a comfortable seat and there is plenty of room for your legs. When I tested it out in economy mode I got approximately 15 miles while still going up a few hills here and there. It has rugged front shocks and tires which lets you navigate good and comfortably even if the train is harsh. A great solution for the daily commute, those without a drivers license looking for a bit more freedom or as a silent transportation on hunting trips. Another very popular Razor scooter is the E200. It is a lightweight, yet powerful model that targets kids between the ages of 5-13. It delivers a good speed of 12 mph which is perfect for the user in mind and it is said to have an ultra-quiet high torque chain-driven motor. The motor is powered by a 24v lead acid battery giving your boy or girl a decent 40 minutes of fun. It has a good ground clearance thanks to its 8-inch pneumatic tires which also helps reduce shocks on bumpy terrain. A full-sized deck that gives you plenty of foot-room and a twist-grip throttle for easy and accurate adjustment of speed. Thanks to the 8-inch pneumatic tires it has a good ground clearance and the inflatable tires also help in reducing shocks when riding on uneven terrain. A full-sized deck that gives you plenty of foot-room and a twist-grip throttle for easy and accurate adjustment of speed. The big differences between the RX200 and the E200 are that the RX200 are more off-road friendly. The new model RX 200 have a few new features up its sleeve including off-road tires, disc brake and improved gear ratio giving the motor higher torque to enable off-road riding. With the RX200 the ride starts where the pavement end, just as Razor describes the scooter themselves. I highly recommend the E200 to those with young children as it may be used for many years to come. My guess is that 4-5 years old can handle it well as my kids have no problem riding it. If you have a dirt track nearby your house you should definitely go with the RX200 instead, just keep in mind that the price differs around $60-$70. Full steel body provides a safe and sturdy ride. Large pneumatic tires that provides a smooth ride. Perfect for 6-year-olds up to teens. Assembled in under 2 minutes. Swagtron’s addition to the e-scooter market is the Swagger. It is aimed to please the adult audience with a decent maximum speed of 15 mph and a distance that varies heavily between 5-15 miles depending on weight and inclines. However, as an adult at 175lbs, it never took me further than 7 miles and the battery capacity declined pretty fast after a few recharges. When the capacity declines so did its performance and at a 50% battery level it was barely fun for me to ride on. But hey, you can always help it out with some human leg power. If you are looking for a budget scooter or if you’re a teenager the Swagger is a decent pick. For those around 90-120lbs, the performance decline would be less noticeable and you would probably be able to go around 9-10 miles on a single charge. Cost-effective transportation. The cost-effectiveness riding one isn’t even comparable to a fuel driven vehicle. Therefore your cost for transportation will be drastically lowered and you will end up with more money in your pockets. Easy to operate. Learning to ride a scooter takes approximately 5 minutes and is as simple as stepping up on the footpad and twisting the throttle. Lightweight and portable. The total weight for these type of transportation vehicles comes in at around 28 lbs, which means that you can easily take it with you anywhere. How do you know which model might be the best fit for you? There are a few important things to consider when choosing a scooter. Whether you’re looking for an electric scooter for your kids or you need something sturdier to suit an adult these six questions are a must. There are a few important questions you should be asking yourself when choosing a scooter. Whether you are looking for a kids model or you need something sturdier to suit the needs of an adult, these six questions are a must. What type of scooter do I need: Will you be using it to commute to the office or just for fun. How far do you need to go: Make it clear how far you’d want it to go on a single charge, and narrow your options down to just those that fit the bill. Weight Capacity needed: While looking at an electric scooter for kids weight capacity might not be of much importance. But if you are looking at electric scooter for adults you need to make sure that it can carry enough weight to take you and whatever you might need to bring with you, whether it be a laptop or a bag of groceries. Changeable battery-packs: If you need to go greater distances or just want to reduce the downtime in between charges, make sure you can utilize an extra battery pack. This doesn’t only extend the distance you can go on a single run, it also works as an insurance that you can have in your backpack. Price point: You want to get the best price so don’t forget to compare similar products and make sure to look for any ongoing discounts or promotions. Making sure its a match: Once again make sure the electric scooter you’re looking at will have enough range, weight limit and speed to cover all your scooter needs. After you’ve checked off point 1-6 you should feel educated enough to make a smart electric scooter purchase. Knowing the basic ingredients that make up an electric scooter might be one of the most important factors when trying to figure out which one you might be interested in. Therefore I’ve created a short introduction to each part below and what purpose they serve. Frame: The thing that holds everything together should be built out of high-quality materials otherwise it can be bent easily. The frame can be made out of various metals such as carbon, aluminum, and steel. If you want a sturdy structure that can accommodate a heavy load, go for steel. If you want a lightweight and portable unit, then you should stick with carbon or aircraft grade aluminum. Motor: Brushless electrical motors are the most common and they range between 100 all the way up to 2500watt. Nowadays most scooters utilize hub motors, a hub motor is a motor built into the wheel of the scooter. These are very silent and you won’t even see it. However, there are still some models mainly from Razor that are still using the old chain driven motor. Battery: The unit is powered by either one or multiple lead acid batteries or the more common lithium-ion battery. They both have their strengths but I always prefer lithium-ion batteries due to them weighing a lot less, have a faster recharge time, and a longer lifespan. Brakes: A key component on every electronic transportation vehicle is the braking system. The ability to get good braking power when you need it is of utmost importance. There are a few different braking mechanisms used and these are mechanical, electronic, fluid. Some have the basic bicycle brakes or engine brakes, but the most common and safe one is the mechanical disc brakes. These braking systems rarely leave you hanging and are very safe providing you direct and accurate braking power whenever needed. Electronic disc brakes are also something we see a lot on today’s e-scooters and these are very good. But be cautious that electric brakes can if something goes wrong stop working, therefore most scooter manufacturers have additional brakes in case of an emergency. Features: Alongside the parts that make up the scooter you have the extra features such as seats, leg-stand, lights and other things that are merely there to support and enhance the rider’s experience. By now you should have gotten familiar with the idea of owning an electric scooter. Now, all that is left is for you to narrow down your choices and you’re all set. Envy The Ride! We have a whole section that caters to kids and the safety aspect of riding, including what you should consider prior to making the purchase. Read more about buying a safe scooter for your kids here. Now that you’ve read our guides and know how they work you should have no problem finding the best electric scooter for adults. Glion Dolly Review - The perfect commute electric scooter?